During either player’s turn, you can activate “Magical Musket” Spell/Trap Cards from your hand. 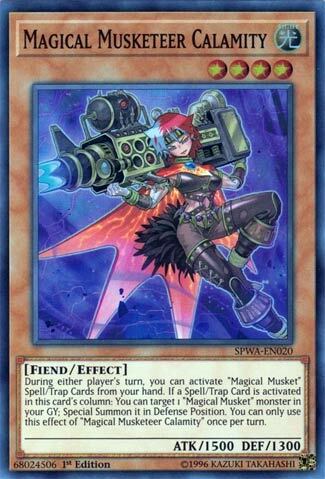 If a Spell/Trap Card is activated in this card’s column: You can target 1 “Magical Musket” monster in your GY; Special Summon it in Defense Position. You can only use this effect of “Magical Musketeer Calamity” once per turn. So everything here is pretty similar to Monday, but instead of Drawing cards when you align a Magic/Trap card in the column, once per turn you get to Special Summon a Magical Musket Monster from your Graveyard in Defense position. She adds some speed to the Deck, and with others from the week (and not) she can generate advantage to the player in short order also. I find myself rather liking these cards.